Looking for a good Cordless Impact Gun. Thread: Looking for a good Cordless Impact Gun. Baubau, I am very impressed with the Milwaukee 3/8" cordless ratchet kit. I would highly recommend it to anyone. I have been using makita tools for a long time, I also like Milwaukee 3/8" cordless impact wrench like you said. But now I want to buy a 1/2" cordless impact for car, after doing amount of research, I found this page ( https://www.powertoollab.com/best-co...ch-automotive/) have pertinent suggestions, also recommend Milwaukee 2454-2 Impact Wrench and Craftsman C3, I was going to try Bosch tools, but after reading it, I want to purchase Craftsman. My question is that how about Craftsman C3? My only worry is that its warranty only 1 Year. What's your suggestion? Any suggestions? Price is some what of any issue. What size drive do you want? 1/2" 3/8"? And they come in different voltages. They also come in kits with extra batteries, charger and case or some come with only the tool. An 8V, 3/8" drive tool only starts at around $60 while a 1/2" with an extra battery, charger and case can be over $400. Most kits run about $200 to $300. The 18V, 1/2" ACD Kit would cost you $265. I don't have one because I can't justify that kind of money when my Ingersoll 1/2" air impact works as well for jobs that require more torque than my M12 3/8" Milwaukee cordless impact. But if you want the best then the Milwaukee M18 cordless impact is the one to get. I hate to say it but in this case you get what you pay for. I personally would not invest my money in any Craftsman tools. They are more along the line of homeowner type tools. I did own a Craftsman 19v multiple tool set with skil saw, drill, sawzall, light and it worked fine for jobs around the house, but not for serious commercial work. BIG difference in torque between the Crastsman C3 and the Milwaukee M18 Fuel 1.2'' impact. The Craftsman C3 is rated at 200 ft. lbs of torque while the Milwaukee is rated at 1100 ft. lbs of torque. The Craftsman with 200 ft lbs is in a lot of cases not enough power to even take off car wheel lug nuts. Rural King is like a Home Depot, Tractor Supply and Cabella's on steroids all rolled into one store. They even have a relatively small grocery section. Give you an example -- I have a wood burning pellet stove that I really like. This is my 10th year with a pellet stove. Home depot and Lowes sells their wood burning pellets this year at $ 5.19 for a 40 lb bag. Tractor Supply is $4 a bag and Rural King sells theirs for $3.19 a bag and they are good burning pellets. Tractor supply ones this year really sucked. Didn't burn as hot and a lot of ash. Rural King was on par with Home Depot and Lowes for the quality of the wood pellets but by far the best price. On a normal cold winter day I will go through one bag a day. Less than a $100 a month for home heat is pretty good in this part of the country. If you have a wife and kids who demand it be 80 deg.f all winter then you will use considerably more pellets. I keep my place around 70 deg f. Don't really like it much warmer than 70 in the winter. Bummer, the closest one is 2000 miles from me, I think I will have to go somewhere else to get my Black Diamond blasting material. Recently picked up a Milwaukee 2668-20 M18 Cordless Li-Ion 3/8" Right Angle Impact Wrench. This tool I am really digging. So much faster. My buddy has a shop and I saw him use it so I got one and think it is a must have in a shop.. I thought I would add some info to this thread. I have been picking up Milwaukee cordless M12 and M18 tools to the tune of at least a couple tools added per month. The M12 metal cutting bandsaw (same configuration as a Porta-Band), really nice tool. Yesterday I picked up a M12 cordless hacksaw that will come in handy. A couple days ago I picked up the mac daddy of all 1/2" square drive cordless impacts which is the M18 with 1400 ft lbs of torque. That is one bad mo fo. I couldn't justify $450 to $500 but I came across a deal for $325 with a charger, two 6.0 batteries and a carrying bag. I have like 8 Milwaukee cordless tools so far in the last six months and they are the best cordless tools I have owned and used. Makita 18V lion impact drive and drill combo have served me well for more than a decade and the makita 9V stick battery ones for many years before that. Excellent tools. I have a bunch of Ryobi cordless tools used mostly for yard maintenance and wood working saws etc. Great tools for around the house. I have a cordless DeWalt 1/4" hex driver and drill combo in 18V and 20V that are excellent tools. You're probably thinking " why would this guy buy all those cordless tools ?" The short answer is I buy and sell things as a hobby (not cordless tools related) and sometimes I make a really good profit on a sale. That to me is considered "found" money meaning it doesn't come out of my regular finances. Kind of like "mad money" that I can spend on whatever I want without feeling guilty about spending money from my income/savings. This past week I picked up a newer John Deere D110 with a blown engine (rod through the side of the block). I paid $75 for the tractor which was in excellent condition with the exception of the bad engine). I found a brand new factory correct engine for it on Craigslist still in the box for $295. I spend about 4 hours replacing the engine, another 3 or 4 hours wheeling out and detailing the tractor itself. Less than $400 invested. Put it on Craigslist and sold it for $950 to the first person that looked at it. $550 profit doing something I really enjoy doing. Point being that's "extra money" from a hobby that I can buy whatever I want to with it. Going to go look at a couple more John Deere's today. Normally I won't mess with any john deere that cost less than $5000 new because in many cases there is no margin of profit on big box store "value line" john deere's. But I have a contact at a john deere dealer where I can buy used/damaged tractors that customers didn't want repaired and just decided to buy a new tractor and told the dealer to just keep the tractor that needed some work. A few weeks ago I picked up a john deere zero turn that ended up being a really easy fix and make close to a thousand dollars profit. Everything I sell looks and runs like new when I put it up for sale, usually sells to the first person that looks at it. I really don't need the money as I do fine financially even if I just sat on the couch all day everyday. But I can't do that, I have to keep busy doing things that I enjoy doing. Long story short is it's one hobby I have that pays instead of costing money. John Deere.. Now we're talking. Got a1972 112 w/ Hydraulic lift and a 1975 212 46 inch deck and plow. Got them both for free and use the JD 212 as my main machine. Those Kohler cast iron thumper engines are awesome. Sorry for the thread hijack. I use my cordless on them. Those old John Deere cast iron 100 and 200 series were bullet proof. Very heavy duty tractors with the exception of the 108, 111 and the 116 (briggs engines). Probably the best one was the 140 H3. That was a "last a lifetime machine" with full hydraulics and the old Kohler cast iron engine. I just picked up a Trac Vac 880 that is in nice condition, needs a carb cleaning. Along with that I picked up 4 more John Deere lawn and garden tractors for a combined price of $350. One is a GT275 (the GT stands for Garden Tractor, much more heavy duty than the lawn tractors) with hydrostatic and a front blade. Tractor is in abnormally nice condition, needs a fuel pump. I should get at least $1500 for that GT alone. Trac Vac will sell for at least $600 to $700. That still leaves three more John Deere tractors in the package deal. Just doing what I like doing and something I'm good at. A hobby that pays instead of costing money. Oh, and I use my cordless tools repairing them. LOL. You should start selling those things out here in Northern California, a bit of a drive for you but... Everyone out here thinks that they are made of gold or something. I was looking for one of the little mini JD skip loaders for my little two acres, I stopped looking for used ones as they were either almost new prices or pure junk - One guy told me that "It runs great, at least it did before it stopped running"
Like my brother says " if a person painted a turd green and yellow someone would buy it ". Resale on John Deere stuff around here is high also. Come on Phil, you can paint your new truck to bring a higher resale value. That truck is cool. About a 1951 Chevy ? But the John Deere logo painted on the door is wrong. 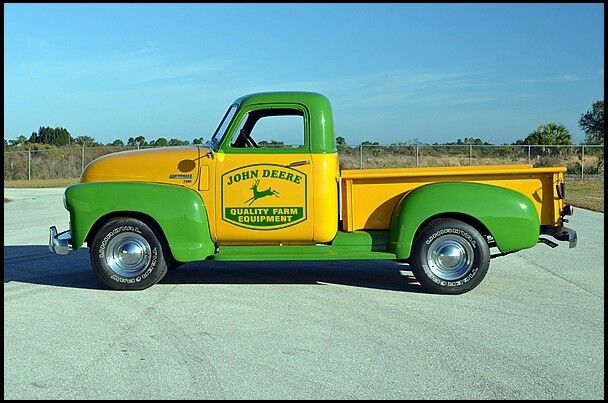 It's a mismatch of different years in the evolution of the John Deere logo. In that picture of the truck the deer's antlers should be pointed forward, not back, to be correct for the slogan underneath the deer. The slogan and the deer with rear facing antlers were never used together. By the time the slogan " Quality Farm Equipment" was first used (1950) the deer's antlers were facing forward. Last edited by Phil V; 07-22-2018 at 08:44 AM. So, it that a '51 Chevy pickup ? I can see the grill so I don't know for sure. Where's Brian at ? He would know.